Present state: Platforms and ramps down from road are still visible from Runcorn Road..
Daresbury Station was situated on the Birkenhead, Lancashire & Cheshire Joint Railway’s (BLCJR) Warrington and Chester line which opened on 31 October 1850. Daresbury Station opened as Moore after the village in which it was located on 18 December 1850. 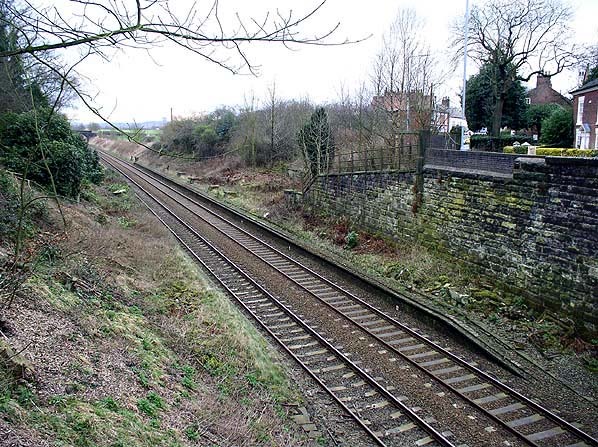 The station was located in a cutting on the south side of a road overbridge which carried Runcorn Road over the line. 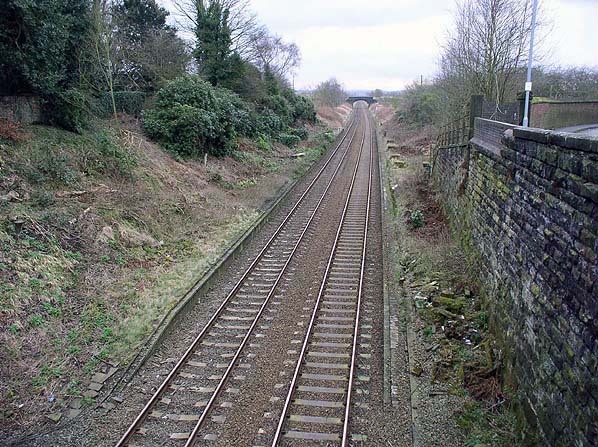 The BLCJR was a double track railway so Moore was provided with two platforms which were linked to Runcorn Road by sloping footpaths and steps. The main facilities were located in stone built buildings on the down platform (Warrington direction). Waiting facilities were provided on the up platform (Chester direction). At the time of opening the Station was served by trains that ran between Warrington and Chester and onward to Birkenhead. On 1 August 1859 the BLCJR became the Birkenhead Railway but within a matter of months it was taken over jointly by the Great Western Railway (GWR) and the London North Western Railway (LNWR) as the Birkenhead Joint Railway on 1 January 1860. In April 1861 the new company renamed the station as Daresbury which is a small village about 1 mile distant from Moore. The reason for the renaming was probably to avoid confusion with another station in Moore which was located on the LNWR's main line between Crewe and Preston. 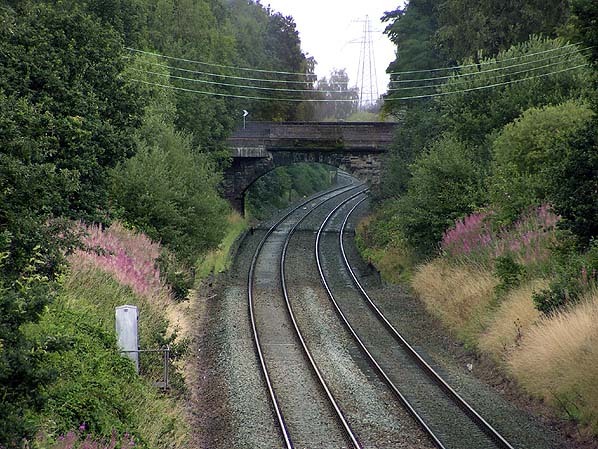 The GWR used the line through Daresbury as a means of access to Manchester via Warrington and lines belonging to the LNWR. Daresbury Station itself however remained very much a local facility served mostly by local stopping trains. In July 1922 there were nine up and seven down trains Mondays-to-Fridays as shown in the table below. There were two trains in each direction on Sundays. In 1923 the LNWR share in the joint line passed to the London Midland and Scottish Railway (LMS) who absorbed the former company as part of the ‘Grouping’ of the country’s many railway companies into four large organisations. The GWR retained its own identity. was for Warrington Bank Quay at 8:10am and the last was for Manchester Exchange at 7.45pm. On 1 January 1948 Daresbury became part of British Railways (London Midland Region). The summer timetable for 1948 showed six up and six down trains from Daresbury Monday-to-Friday as shown in the table below. On Saturdays there were extra trains and on Sundays there were two trains in each direction. After 1 February 1943 Daresbury had been the only station to serve the residents of Moore as the former LNWR station had closed on that date. Despite this the sparse train service provided to Daresbury station did not generate much income and it did not survive long after nationalisation of closing to passengers on 7 July 1952. The station continued to handle goods until the 1 June 1965. The line through the station site is still in use today for goods and passenger services and consideration has been given to re-opening the station in local transport plans. The platforms at Daresbury Station, along with the access ramp on the eastbound platform could still be seen in February 2013. 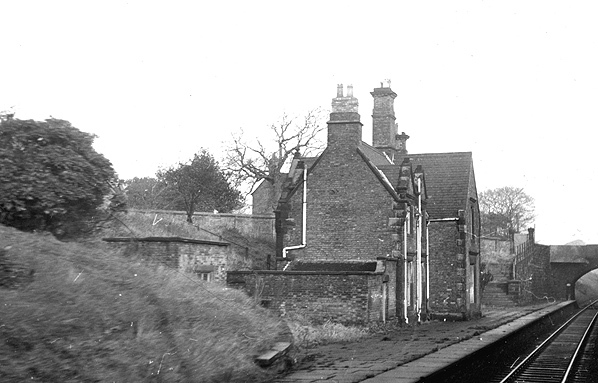 Daresbury station looking north-east in the 1960s. Daresbury station shown on a twenty five-inch map from 1897. Daresbury station looking south-west from the entrance to the up platform in February 2005. Looking north-east at the remains of Daresbury station in August 2010. Both platforms were extant, although heavily overgrown as can be seen in the picture. Looking north-east along the down line at Daresbury station in February 2013. The down platform can be seen to the left. The steps that provided access to Runcorn Road can also be seen. Daresbury station looking north-east in February 2013.